The increasing cost of healthcare coverage is unsustainable and the critical driver behind health reform. Between 1999 and 2011, annual health premiums rose from $2196 for individuals and $5791 for families to $5429 for individuals and $15,073 for families. 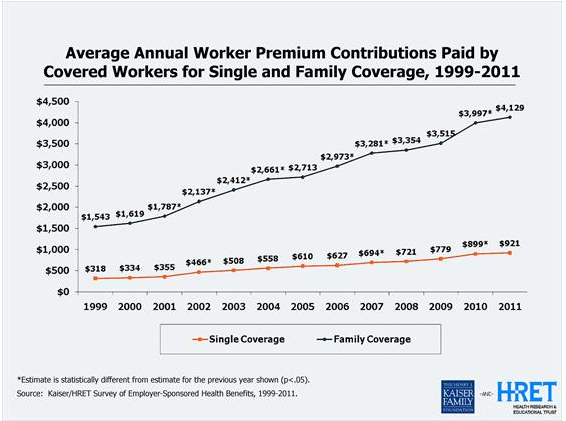 The average share of premium expense paid by covered workers has increased over this same period for single coverage from $324 to $924 and for family coverage from $1548 in 1999 to $4128 in 2011. This is in addition to increased out-of-pocket costs due to higher deductibles and increased copayments.